Helena Keskküla (b 1992) graduated installation and sculpture deparment of Estonian Art Academy. In 2013- 2014 she studied at Art Academy of Vienna. Her main media are video and sound, with what she talks about youth, attitudes and expectations of society, humorously changing ones perspectives. 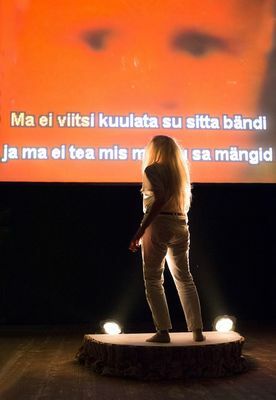 In 2014 Kekküla and Art Nõukas formed a duo Art and Helena what followed with 2 solo shows. Second solo show in 2016 entitled "Pärnu sinks and i go along with it" lead to a cooperation with a coreographer Kadri Sirel (perfomance at the NU performance festival in 2016 "+1") In 2017 Keskküla has worked as set designer with Sirel's dance peformance and prepares for her third solo exhibition.